A great snack without the guilt! Airblown popcorn with 10 grams of protein and half the calories of regular popcorn...Doesn't get much better than that! 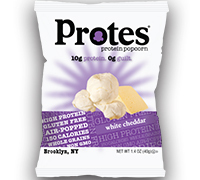 Protes Protein Popcorn is an ideal alternative to traditional supermarket popcorn. Popped to perfection and bursting with flavor, this satisfying snack is great on-the-go, before or after the gym, or as a guilt-free lunchbox treat. Plus, it’s available in two delicious flavors, White Cheddar or Sweet Cinnamon. Snack Healthy! A great side to a meal or a snack without regrets, Protes will quickly become your favorite snack that you won’t believe is good for you.